What is Schiff Glucosamine Plus MSM? 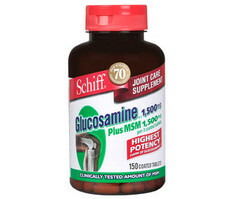 Schiff Glucosamine Plus MSM is a joint supplement from Schiff which also makes Schiff Move Free Advanced. Schiff Glucosamine Plus MSM has all the ingredients that joint supplements have been using for years. It has 1500mg of glucosamine HCl and 1500mg of MSM. Schiff Glucosamine Plus MSM has titanium dioxide coloring. Boron Doesn’t have boron. eople that have boron as a part of their diet have a lower chance of developing osteoarthritis. Methylsulfonylmethane (MSM) Has 1500mg of MSM, more than the average amount. MSM is a vital source of sulfur for protein and connective tissue synthesis. Hyaluronic Acid Has only 3.3mg of hyaluronic acid, a very low amount. Hyaluronic acid is a vital fluid found in the synovial (joint-lubricating) fluid. I have high blood pressure. it had been under control until about 2 weeks after I had been on Schiff Glucosamine plus MSM 1,500mg a day. Would this affect my B/P? Thank you so much for your all so helpful site. I have really been looking and comparing Joint Supplement products. I am so glad I ran across your site. I did not know of all the important ingredients. Most supplements do not come with any of the ingredients that you do recommend. I am going to do my best to find Mendamine at my local Health market.